In 2016, Gary Schmidt released the super solid album Landscapes Of The Heart that was produced by Will Ackerman and featured Will’s A Team session players. While this reviewer apparently blinked and missed this release initially, it was a stellar recording so how do you reduplicate this feat? You don’t and instead you wait 2 years and then do something completely different. As a result Even For A Moment is a self produced album that is your classical example of less really does mean more. 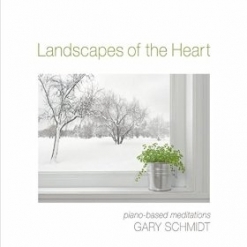 So while the musical landscapes when comparing Schmidt’s latest creation is very different to his prior release, he smartly refocuses on his delicate and delicious piano work, but it does not come without some musical assistance. He collaborates with three musical accomplices that come in the form of Hannah Alkire on cello, Sherry Finzer on flutes and brother Roger Schmidt on guitar. And while the musical landscape is somewhat more bare it creates a canvas of reprieve and respite without it being unflavored. Of the fourteen tracks presented, only two of them are not self composed but it is Gary’s material that is preferred. The album opens with the slow smooth solo work of Schmidt on “If This Is The Time” that then merges into the meandering “Inside The River” that also features Hannah Alkire on the cello. Hannah is also well featured on the stellar “Simply By Looking”. Meanwhile, “No Better Gift” with Sherry Finzer on flute is also a very special moment. But if pressed for a favorite track it would the gorgeous flow found on “Face That Lights My Face” along with Roger’s light acoustic guitar work that certainly stands out the most. Brother Roger revisits on the hauntingly beautiful cross rhythms of “Sub Tide”. 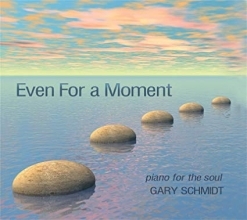 Closing out the album like it was opened with just Gary and his piano with the stark “Postlude To A Moment” Schmidt latest recording is full of memorable compositions and arrangements. If Even For A Moment or better than that the whole 54 minutes of this album, please find the time to listen to this delightful recording as it is a wonderful audio refugee from the chaos that life sometimes throws at us.